MYRON J. MITCHELL* The biota of soils constitute an integral part of both natural and agronomic ecosystems. The soil microflora and fauna in conjunction with the belowground portion of the Metaphyta or higher plants constitute the living milieu, components of which are in intimate association with each other as well as the abiotic constituents of the soil. 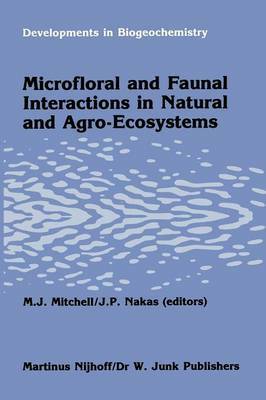 Since these associations or interactions are important in regulat- ing both the flux and availability of energy and nutrients, the central theme of the present book focuses on these interactions. The effects of microfloral and faunal inter- actions with regard to overall ecosystem dynamics and specific critical processes will be examined. HISTORICAL ASPECTS The coverage of this volume is an extension of a vast body of literature which dates back to the 18th century. A brief compendium of major books and reviews published from 1960 to 1983 is given chronologically in Tables 1 and 2, respectively. Russell (1961) has reviewed work in the 1800's during which some of the basic tenets on the relationships between plant nutrition and soil properties became estab- lished. In this period agricultural science was founded and the study of soil bacteriology began. The evolution of soil biology up to the early 1970's has been described by Satch211 in the volume edited by Dickinson and Pugh (1974). *Department of Environmental and Forest Biology, SUNY, College of Environmental Science and Forestry, Syracuse, NY 13210 2 ~ .